My name is Thelma. It's now 3 weeks back I fell in a drain; the drain was not so big, cause u can't actually see the drain because it's covered with grass. Anyway my right foot did get worse sore; I went to the hospital immediately, but they took xrays and said nothing is broken. The next friday passed and I stil have a lot of pain an my foot is swelled, so the next tuesday my husband take me to a general doctor just to check why it's swelled and still so painful; the doctor checked my foot an said he is worried why its still swelled and so blue. Ok he gave me also pain tablets and wintergreen to rub my foot,then he said I must come back the next tuesday if it's still swelled; I was supposed to go but I don't have the money to pay the doctor, so now its the 3rd week and I can't still tramp on my foot an my ankle is still swelled. If you have anything further to add, please don't write from your phone. I've just spent ten minutes half correcting your grammar and spelling! Start to ice your ankle daily and whilst sitting wriggle the foot and ankle. It helps to disperse the swelling. An ankle guard would help. It needs to be tight. You have at least torn some ligaments and most likely displaced a bone in the ankle. 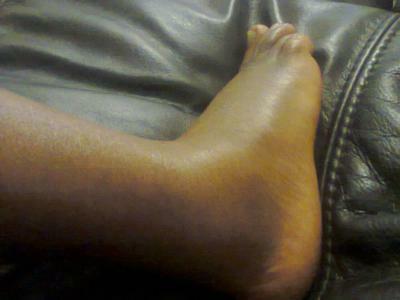 When you turn your ankle like that, the talus or calcaneus are often subluxated. That needs to be checked and the displacement reduced otherwise your foot and ankle will just go on being sore. Keep the weight off it. Use a crutch. Start with a new x-ray. Sorry, but this is going to cost you money.